A cave is a naturally occurring hollow area inside Earth. All caves are formed by some type of erosion process. The study of caves is called speleology (pronounced spee-lee-OL-o-gee). While some caves may be small hillside openings, others may consist of large chambers and inter-connecting tunnels and mazes. Openings to the surface may be large gaping holes or small crevices. Caves have served as shelter for people throughout history. Many religious traditions have regarded caves as sacred and have used them in rituals and ceremonies. Human remains, artifacts, sculptures, and drawings found in caves have aided archaeologists in learning about early humans. A cave discovered in southeastern France in 1994 contains wall paintings estimated to be more than 30,000 years old. The most common, largest, and spectacular caves are solution caves. These caves are formed through the chemical interaction of air, soil, water, and rock. As water flows over and drains into Earth's surface, it mixes with carbon dioxide from the air and soil to form a mild solution of carbonic acid. Seeping through naturally occurring cracks and fissures in massive beds of limestone in bedrock (the solid rock that lies beneath the soil), the acidic water eats away at the rock, dissolving its minerals and carrying them off in a solution. With continual water drainage, the fissures become established passageways. The passageways eventually enlarge and often connect, creating an underground drainage system. Sometimes ceilings fall and passageways collapse, creating new spaces and drainage routes. Over thousands, perhaps millions of years, these passages evolve into the caves we see today. Several distinctive features in the landscape make cave terrain easy to identify. The most common is a rugged land surface, marred by sinkholes, circular depressions where the underlying rock has been dissolved away. Disappearing streams and natural bridges are also common clues. But entrances to solution caves are not always obvious, and their discovery is sometimes quite by accident. Speleology: Scientific study of caves and their plant and animal life. Stalactite: Cylindrical or icicle-shaped mineral deposit projecting downward from the roof of a cave. Stalagmite: Cylindrical or upside down icicle-shaped mineral deposit projecting upward from the floor of a cave. A deep cave is completely dark, has a stable atmosphere, and has an almost constant temperature. The humidity in limestone caves is usually near 100 percent. 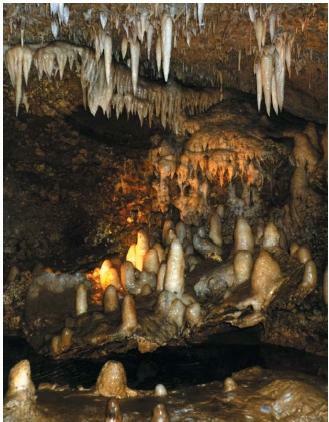 Many caves contain unique life-forms, underground streams and lakes, and unusual mineral formations. sta-LAG-mite). Stalactites and stalagmites grow by only a fraction of an inch or centimeter a year. In time, two such formations often merge to form a stout floor-to-ceiling column. Sometimes the water runs down the slope of the wall, and as the calcite is deposited, a low ridge forms. Subsequent drops of water follow the ridge, adding more calcite. Constant buildup of calcite in this fashion results in the formation of a wavy, folded sheet hanging from the ceiling called a curtain. Curtain formations often have streaks of various shades of off-white and brown. Three different groups of animals use or inhabit caves. Animals in the first group commonly use caves but depend on the outside world for survival. These include bats, birds, bears, and crickets. Those in the second group live their entire life cycle within a cave, generally near the entrance, but are also found living outside caves. Cockroaches, beetles, and millipedes are some examples of this second group. The last group comprises animals that are permanent deep cave dwellers. Because they often live in total darkness, these animals lack skin color and eyes. They rely on their sense of touch to get around. Examples of this group include fish, shrimp, crayfish, salamanders, worms, snails, insects, bacteria, fungi, and algae. What are some examples of solution caves? I am looking for actual names of solution caves in the US.